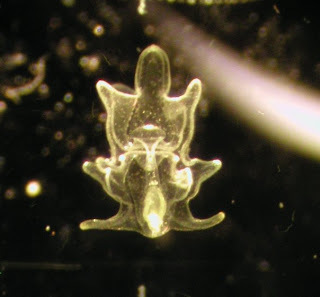 The Echinoblog: Pycnopodia Juvenile Stage Has Arrived!! What does Pycnopodia look like before it starts growing into an "adult"??? 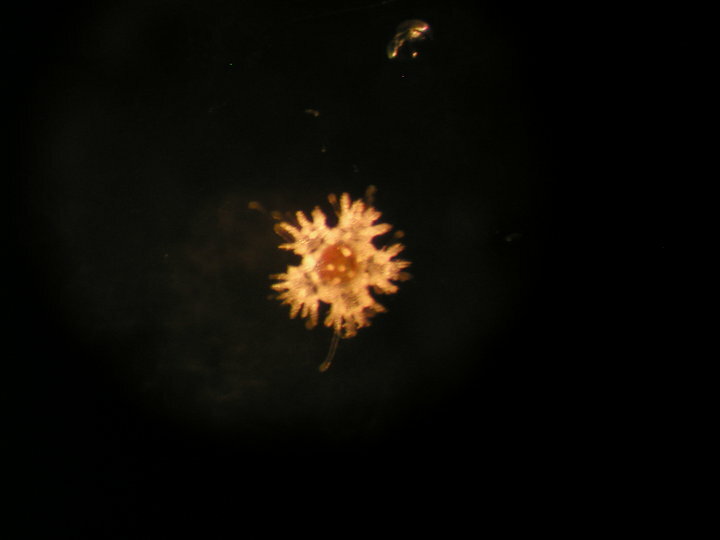 My colleague Dr. Allison Gong at the UC Santa Cruz Long Marine Laboratory recently had the fortune to observe the spawning and early larval development of Pycnopodia helianthoides-the sunflower star one of my favorite animals! Info and the comments below are graciously provided by her (seen above in her natural habitat)! Apparently the gametes collected were produced by these hefty beasts on display at the Seymour Center. There are four in the aquarium. 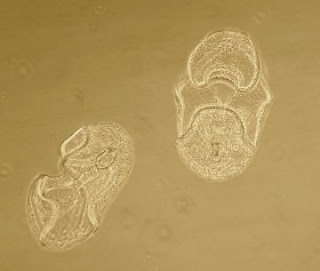 Each one may be either the mother or the father of these larvae. 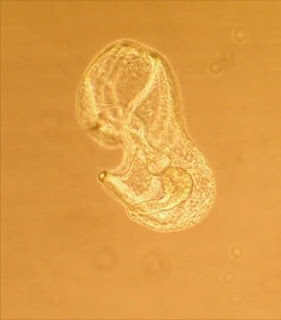 Allison says: "This is a 3-day-old early dipleurula larva. 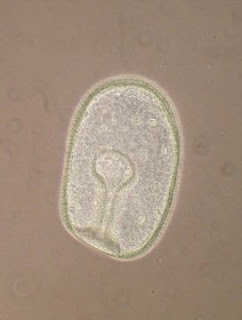 It is basically a ciliated blob with an invagination in the flattened posterior end. 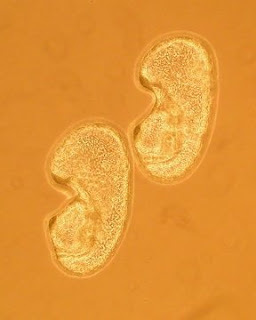 The internal tube and knob structures are the developing larval gut." Allison says: "This photo is essentially the same thing, photographed under dark-field conditions for a rather cool effect." Sez Allison: "These guys sure don't develop as quickly as urchins! 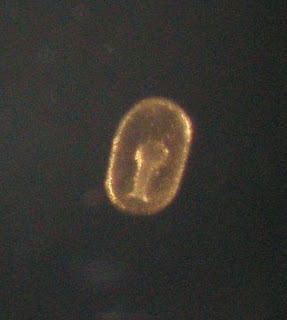 At 14 days, the larva has reach a stage called the bipinnaria. It's sort of a more elaborate version of the dipleurula. In this ventral view, you can see the stomach quite clearly as the darkish ovoid shape in the bottom part." 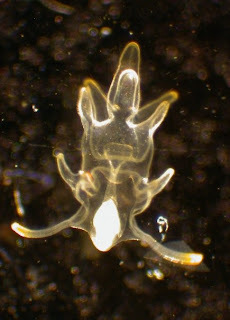 "Here's a left-side view of a different larva at the same stage. These guys are really transparent, and it's hard to get a feel for their three-dimensional structure because the camera focuses on a single plane." "These guys happened to swim under the objective lens at the same time, so I snapped a shot of them. 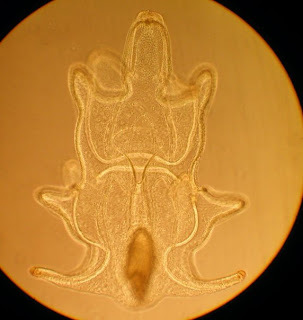 In this photo you're getting both a ventral and a dorso-lateral view." 10 June 2009-Allison Sez: These larvae are growing so slowly! I'm used to things happening more quickly. Oh well. 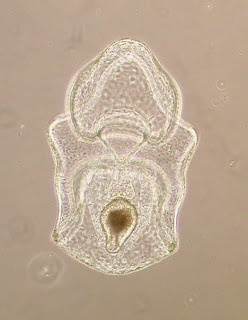 This is a ventral (front) view of a 22-day-old bipinnaria larva. The internal ovoid structure in the lower half is the stomach, with dark food cell visible inside. Here's a trick to "seeing" the 3-dimensional structure in a 2-d photo: Imagine a capital letter 'c' and rotate it 90 degrees along its vertical axis. You're now looking into the "opening" of the 'c', right? That's exactly the view of this larva. The roughly triangular object on the top and the squarish object on the bottom correspond to the ends of the 'c'. Confusing, isn't it? Okay, here's a nice lateral view. The gut is nicely visible in this picture. You can see the elongated esophagus and the sphincter where it meets the stomach. You are looking at the larva's left side, with its anterior end up and its posterior end down. Bipinnaria larvae reaches the 29 day stage! Sez Allison: We had a near miss late last week and lost about half of the larvae. I think maybe they didn't like the food we were giving them. We've altered the diet and the remaining larvae seem happy, although some of them may be arrested at an early stage of development. This individual was the most advanced of all the larvae I observed today. At 29 days it is starting to develop little nubbins that may grow into long brachiolar arms--at least, I hope they do!--and measures 850 microns in length. 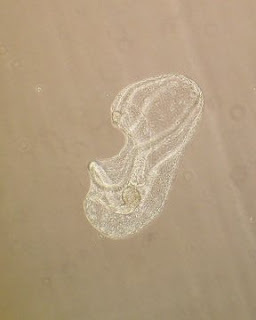 Sez Allison: This larva, at the ripe old age of 49 days, has reached the brachiolaria stage. It measures a whopping 1.5 mm long! The gut is a golden color because we've been feeding them a mixture of green algae and diatoms. The simple band in the earlier stages has been elaborated into pointy little nubbins called brachiolar arms. In other species, such as Pisaster ochraceus, the arms get really long; I don't know how long they'll get in these Pycnopodia larvae. We'll have to wait and see. Sez Allison: Whoa. Huge progress made in the last week! The larvae are 55 days old now and have *finally* started growing the long arms we've been expecting for weeks. 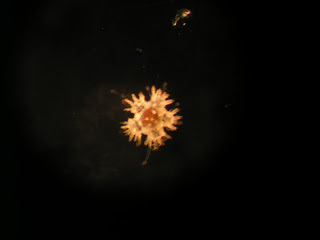 I shot this photo through my Wild dissecting scope to get the cool effect of a dark background. Couldn't entirely get rid of the unwanted glare, though. Oh well. Sez Allison: Here's a closer shot of the same larva. 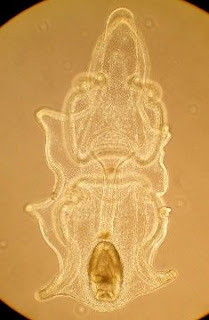 The brownish structure in the bottom of the larva is its stomach. From Allison: Isn't this gorgeous? At 66 days (7 weeks and counting) the larvae have reached the advanced bracholaria stage. The arms are longer and the larvae wave them as they swim around. These guys are still feeding, although they haven't grown much. It looks like they max out at about 1.5 mm in length. This particular larva may not be entirely competent (i.e., ready to metamorphose) yet, but it's getting close. From Allison: Ta-dah! One larva has begun the process of metamorphosis. 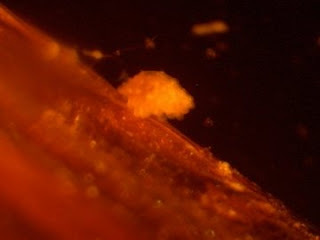 It has attached itself to a small piece of mussel shell with some suckers on the anterior end. 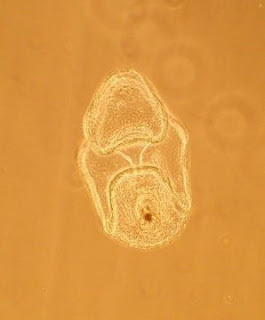 The round structure you see at the top of the animal is the juvenile rudiment, or the earliest stage of the juvenile body, containing the water vascular system's first 5 tube feet. You can see that the brachiolar arms are still there. At this point the critter can no longer feed, as it completely re-arranges its entire body, and survives on energy reserves it put away as a feeding larva. 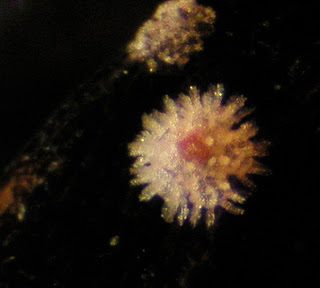 I never get tired of watching this kind of metamorphosis, in stars or urchins. It's the coolest thing out there. In a matter of a few days the animal transforms from a bilateral swimming creature to a pentaradial crawling beast, with a full scale re-arrangement of its external and internal anatomy. Larval parts will be resorbed or discarded, and new juvenile structures will be formed. Amazing, isn't it? From Allison: A star is born! The little guy we've been monitoring, seen here in side view, has completed metamorphosis, and as far as I can tell is doing fine. 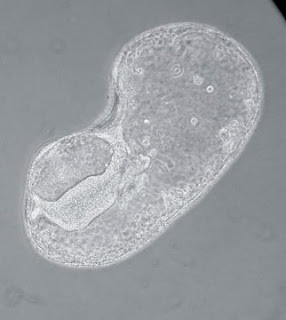 All of the larval body has been resorbed now, and the critter is a little round disc with tube feet and spines. It's not very active right now but I think that's because it's recovering from the trauma of metamorphosis. From Allison: I tried to get a better view of the aboral (i.e., top) surface but immediately lost contrast because the baby star is almost the same color as the bit of mussel shell it's sitting on. At least in this view you can see that it's radial now. Quite a change from the bilateral larva it was a week ago, isn't it? I think these new juveniles will fast for a number of weeks, living on energy reserves they packed away while they were feeding larvae. It remains to be seen whether or not we can figure out what to feed these tiny guys, but we'll try to keep them going and will hopefully be able to document how all of the arms develop. Remember, these stars have ~20 arms as adults, although they start out with the requisite echinoderm 5, and we're interested in seeing if there's a pattern to how all the arms form. 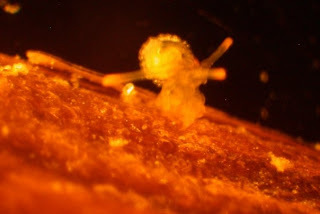 So, a late addendum... have you ever wondered what Pycnopodia looks like when they are just wee babies?? Here ya' go.. According to Allison, this is what they look like 23 days past settlement. They have FIVE rays just like ANY other SEA STAR. Neat, eh?? From here, they grow onto the enormous, multi-rayed forms that we know and love! I suspect that takes AT LEAST several months to years.... so, leave em' alone when you find em as adults! It probably takes a LONG time for them to reach even a 6 inch diameter! Thanks for putting these up, Chris! I feel famous now. 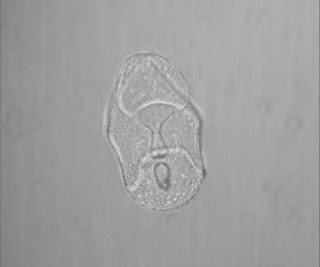 I actually just found out last night that I will shortly be studying echinoderm development and evolution as a post-doc! w00t! 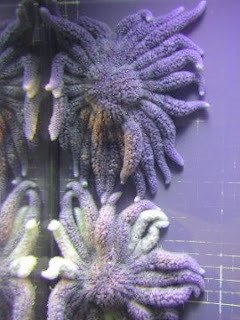 Specifically, I'll be working with sea stars - at least initially. So you can rest assured that I will be coming back here very often. Love the blog by the way - you're style is great! 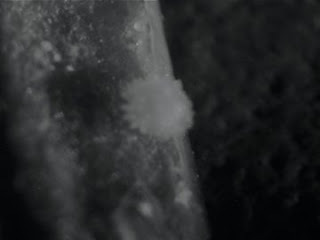 Just for the sake of comparison, how long does it take an urchin larva to reach metamorphosis versus these guys? I looked at my previous records of larval development and came up with these numbers. 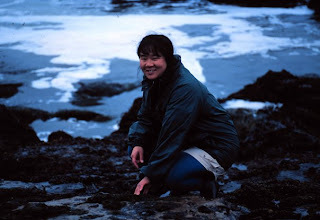 Mind you, these are from my personal experience raising larvae at ambient seawater temperatures in Santa Cruz. Urchins (S. purpuratus) - 35 days, 54 days. Obviously quite a bit of variation there. Sand dollars (D. excentricus) 29(!) days. This was at Friday Harbor, WA. In case you don't know, urchins and sand dollars are both echinoids. I apologize if that comes off as patronizing, I just don't know what your background is. The only asteroids I have data for are bat stars (Patiria miniata). In 2007 I raised a batch that went 47 days before the first metamorphosed. This is my first time working with Pycnopodia, so I don't have a very precise expectation for how long they'll take until competency and metamorphosis. One of my books says it takes 9-10 weeks. Yikes! That's much longer than I'm used to, but it will be fun to watch them as they go along. Tremaster mirabilis..... doesn't that look like a brittle star "disguised" as a starfish. The shape of a classic brittle star is obvious almost like there is one hiding under a thin sheath of skin.